Intragen Cosmetic Trichology Sebum Balance effectively fights excess sebum and protects the scalp, leaving hair healthy, stronger and voluminous, thanks to extraordinary active ingredients. Thanks to Phlorogin, a seaweed extract, it hydrates and purifies the scalp while reducing excess sebum and restoring the proper skin balance. Enriched with Rosemary Extract and Sage Extract, it neutralizes free radicals while toning and strengthening hair roots, providing an antioxidant effect. 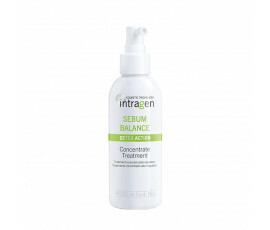 Intragen Cosmetic Trichology Sebum Balance controls sebum glands and deeply cleanses your scalp. Intragen Cosmetic Trichology Sebum Balance reduces greasy scalp up to 27% after just a week. 100% of voluntary consumers report a reduction in sebum production after the second wash.